I actually empathize with Doyle Rice, the author of the article forecasting doom and destruction and Dr. Stephen Strader, the author of the study. It seems logical. But, it probably is not. The Dr. Strader's hypothesis is that the potential for more tornadoes (due to global warming) combined with urban sprawl in tornado alley will cause tornado deaths to triple. Seems logical but there are a few major flaws. 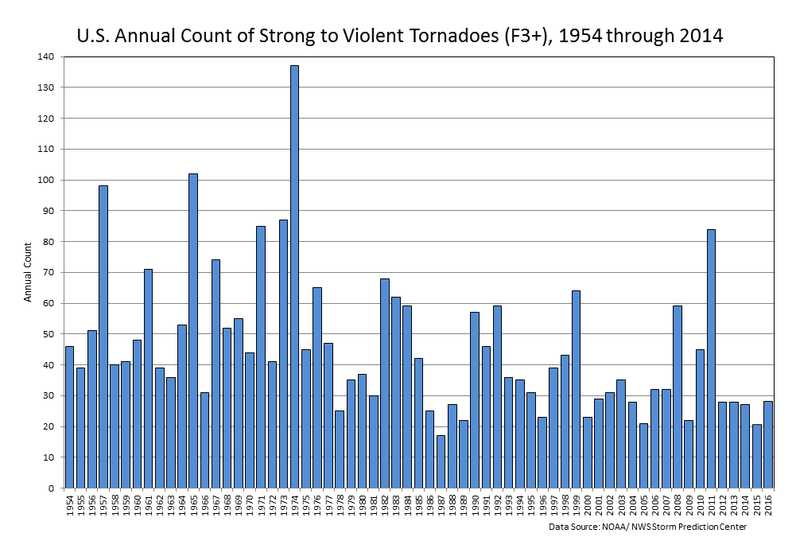 #1 Strong tornadoes are not increasing. The vast majority of tornado deaths are associated with F-3 or stronger tornadoes. 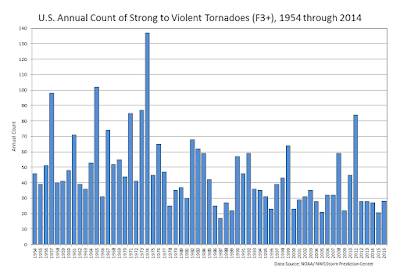 In spite of warmer global temperatures since the early 1950's (when reliable tornado records began), the number of strong tornadoes is decreasing! Since the number of strong tornadoes has decreased with warmer temperatures, there is no reason to believe the number of strong tornadoes will increase with any increasing temperatures in the future. #2 Urban sprawl, so far, has not increased tornado deaths. Since 1975, there has been tremendous urban sprawl throughout Tornado Alley and Dixie Tornado Alley. The population of the DFW Metroplex, for example, has exploded. So has its geographic reach. But, the death rate, deaths per million population has not increased at all regardless of urban sprawl, to-date. 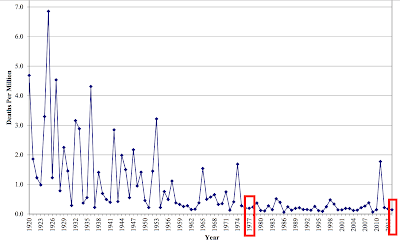 I got my first full-time storm warning job in 1975 and we thought it was inevitable the death rate from tornadoes would increase, especially after the huge bump the year before in the April 3, 1974, Superoutbreak of Tornadoes. Yet, in the last 40 years, from 1977 to 2017 (actually the graph stops in '15), if anything, the death rate has dropped slightly. 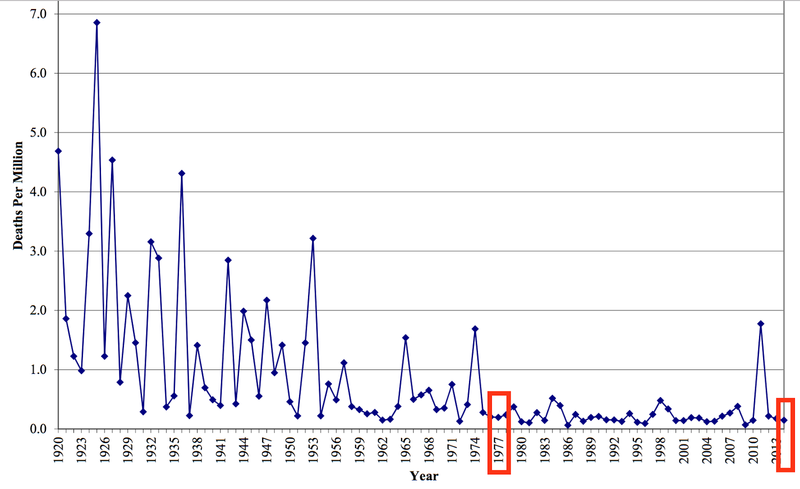 Weather science's ability to warn of tornadoes, plus the improved methods to communicate those warnings, has meant that deaths have stayed very low. There were only 18 (!!) tornado deaths in the United States in 2016 in spite of a much larger population than in 1976. The Conclusion: It foolish to believe we can forecast what the population might be, the state-of-the-science might be, and how well people will or will not respond to tornado warnings in the near 2100. While I agree that houses should be fortified a bit (estimated to add 2% to the wholesale cost) against tornado, hurricane and damaging thunderstorm wind gusts, there is no real cause for alarm.